WMV is a common video format highly compatible with Windows-based computer systems. However, WMV file type often creates rather large files. If you want to upload them onto your website, it will be really time-consuming. Also, the large WMV files will make your opening site annoyingly slow. To solve this problem, convert WMV files to Flash video files, like SWF is a good choice. SWF files are a lot smaller than WMV video files, and are ideal for uploading to websites. To convert WMV files to SWF files quickly and easily, Wondershare UniConverter (originally Wondershare Video Converter Ultimate) is what you need. 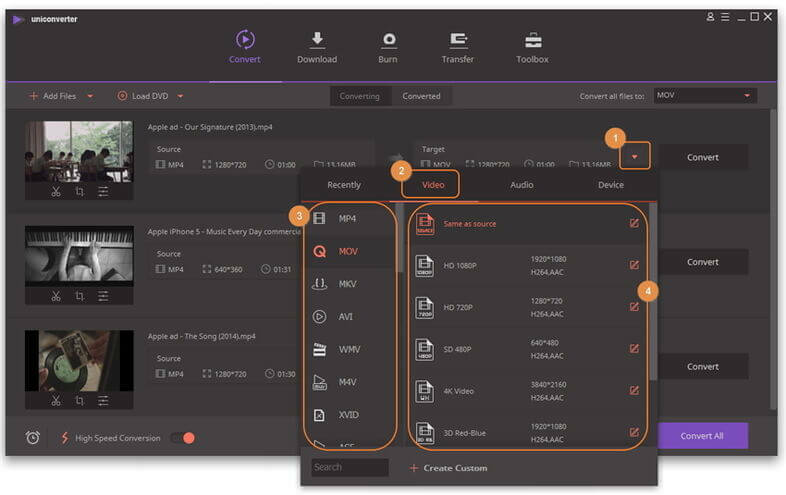 With it, converting any video between players, devices, and applications is a piece of cake for you. Furthermore, with its common editing tools, you can highlight your personality. Now go its fire-new one-click interface, and convert WMV to SWF at your fingertips. Convert WMV to 1000+ formats, like SWF, AVI, MKV, MOV, MP4, etc. Click the button or directly drag and drop your desired WMV video to the program. Go to the Target section and click to get the full list of output formats, then choose Video > SWF and a select a solution in the right. Tips: Here, you'll also see some optimized presets for online video, like YouTube Video, Yahoo Video, Google Video, etc. You can choose whatever floats your boat. 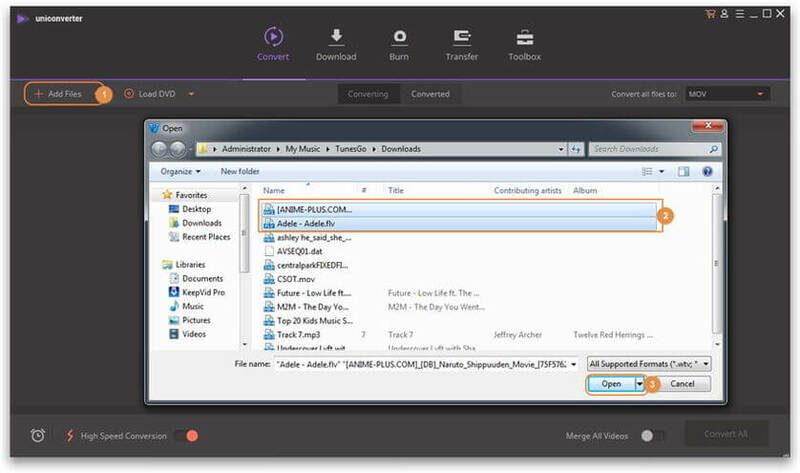 Click the Convert button and let this video converter take care of the WMV to SWF rendering. This video converter is very efficient in converting, and the progress bar will show you the remaining time. When the conversion finishes, you can upload your converted files smoothly and quickly. That's it! Free download this video converter and experience a hassle-free conversion. It is a 100% free WMV to SWF video converter. You can free convert your WMV video and then easily embed it on web. Also, it lets you trim, crop, rotate, add effects, and merge videos. Even you can use it to download videos from many video sharing sites at fastest speed. 1. The original video quality might lose after conversion. 2. Video conversion speed is not as fast as Wondershare UniConverter (originally Wondershare Video Converter Ultimate). In special circumstances, you may have WMV videos that you need to convert to SWF format without having to install additional converter software on your computer. If this applies to you, a good solution is to use an online converter tool. Here we'd like to recommend Office-Converter, which can help you convert WMV to SWF for free within the simple steps below. Step 1. Open the website and then select and upload the WMV files you want to convert from your storage folder. Step 2. Set your output format to SWF. You have the option of further customising your conversion profile by clicking Options button. Step 3. When you're satisfied with your settings, click Start Convert to begin the process. After conversion is complete, click on the Download button to save the SWF file on your hard drive. It is worth noting that while it does a decent job of converting WMV to SWF, you are limited to the size and number of files you can convert. Conversion can also be slow when traffic is high. In addition to that, if you're looking for online converters, then you might often land on websites full popups and other advertisement. Be careful while visiting these sites, some of them can infect your computer with malware. 1. What's the difference between SWF and FLV? FLV: FLV is a flash video file format like MOV. YouTube, Google Video and MySpace TV are always in FLV format. If you donwload a video from YouTube, you may find the file extension is .flv. You can embed FLV video to SWF and play it online. SWF: SWF is a published flash file, derived from the .fla file (the source flash file). SWF is currently the dominant format for displaying animated vector graphics on the web. 2. How to play flash videos on my iPhone or Android phones? Many mobile devices or video editing app don't support FLV or SWF. In this case, you can use a converter to convert videos to be compatible with your device. Or you can just install a flash video player on your device, learn more Flash Players for iPhone and iPad here.